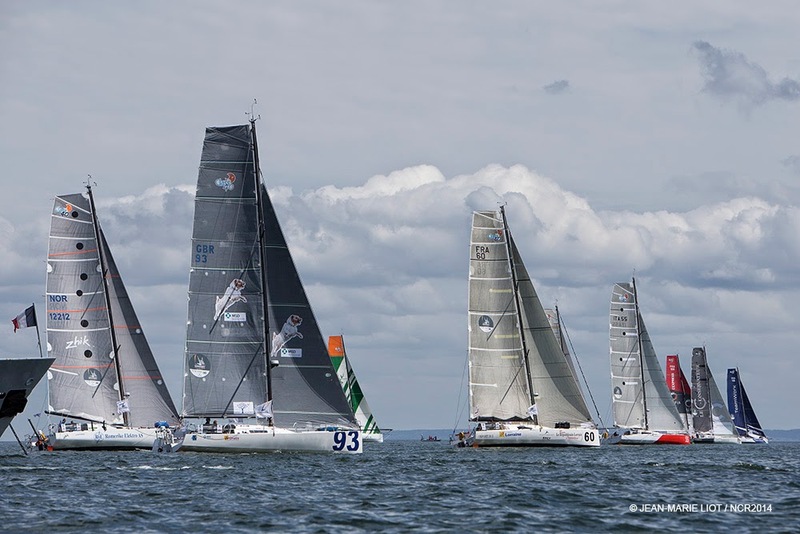 SailRaceWin: Normandy Channel Race : Clean Start for the 2014 edition! 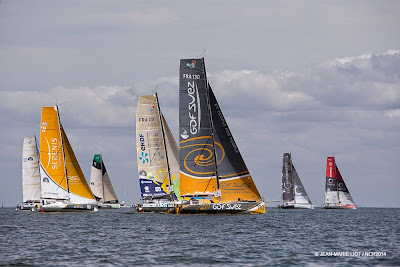 Normandy Channel Race : Clean Start for the 2014 edition! At 1400 hours local time today the 17 duos took the start of the 5th edition of the Normandy Channel Race in a very light southerly thermal. GDF SUEZ is currently leading the convoy bound for the Isle of Wight. An entire little Armada cast off from the pontoons in Caen’s Bassin Saint Pierre this morning to begin their descent along a rather bucolic canal. The parade made the lock gates in Ouistreham to the cheers of a large crowd of admiring spectators, keen to take in the cocktail of technology and history provided by the Class40s, the warship (Vulcain) and the old sailing ships (Marité, schooners, etc.). Once at sea, the fleet made their way to the start line to the north of Ouistreham. Due to the lack of wind, Race Management decided not to do the coastal section and instead sent the competitors straight towards the first course mark: the Isle of Wight via a small windward mark without negotiating the Saint Marcouf islands to the west of the start line. 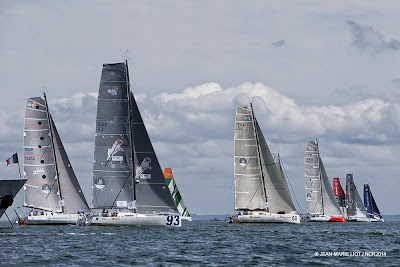 To the great delight of the support boats, the sun deigned to show its face on this Sunday 25 May and the fleet of Class40s set off gently in under 8 knots of southerly breeze, bound for the windward mark to the south of the line. Team Work, helmed by the Mini sailors Bertrand Delesne and David Raison, got off to an excellent start to the left-hand side of the race zone, on starboard tack, but it was GDF SUEZ which was first to reach the windward mark by taking the opposite option. Hot on its heels were Damien Seguin and Jeanne Grégoire on ERDF – Des pieds et Des mains and Team Picoty – Lac de Vassivière (Jean-Christophe Caso and Aymeric Chappellier). The latter rounded the mark and headed due north, whilst the first two, along with the bulk of the rest of the fleet preferred to make their way along the coast for a while before they too headed offshore. This has proven to be a winning option for Team Picoty, but for how long...? The wind is becoming increasingly scarce and the monohulls are now slowly making headway towards the English coast at walking pace. Just 1 mile separates the top 8. It’s going to be a long night for the 34 competing skippers and their mental alertness will be their main asset. However, some small fronts are forecast to join up with them imminently at which point the cards will be reshuffled. This 5th Normandy Channel Race promises to be action-packed. Louis Duc (ADVANCED ENERGIES – Carac): “We’ll have very little wind on the start line so physically it’s not going to be sporty, though the sail changes may well be frequent. Damien and I are going to be really vigilant from the start and we’re going to keep an eye on the current too, which could play tricks on us if there’s no wind. We have a lot of ideas about strategy, since none of the models are very clear. As such we haven’t set ourselves any predefined plans and we’ll always be ready to call our current strategy into question according to what we feel on the water. We have complementary natures Damien and I and I trust him so I can focus more on trimming the boat prior to the start and he can analyse the course and the navigation.